Good for a night time picture Henry. We have some quite good pictures of deer and hares and 1 fox I think. There was also one picture of eyes in the distance, but no idea whether it was fox or badger. Jaki and me taking the dogs for a walk. Mr D'Arcy needs to be on a lead, or else he goes hurtling off on his own. Hollie and Snowbelle tend to follow steadily behind. I doubt we could have posed it better! It's a b*mm*r when those really good offers disappear off the shelves before you get there, isn't it? And I've heard good reports of Aldi Wildlife cameras. Even more so when there are no Aldi stores in the area. It's worse when they knock something down to a really good offer, tempt you to buy it and a week or two after you've bought it knock it down to half price to clear the last few, like they did with the air-compressors. You can now buy Aldi's special buys online, with free delivery. I've just reset my fox trap. Last night, something tried to dig under the back of it to get at the bait and set it off. Trail cam also set to keep an eye on tonights proceedings. Did anything come of that, Bodger? Picked up the last Wildlife camera in Lidl's yesterday for �80, Not that I really need another but thought I should try something other than the Ltl Acorns that I've been using until now. So this is research, right? I've selected where it's going to go, will put it out later and I hope in a few days I will have some pictures worth showing. As the person that started this thread, thought I would provide an update. I ended up getting a camera trap for my birthday rather than Christmas (Bushnell Trophy Cam HD from NatureSpy)...OH did a lot of research and spoke to people at NatureSpy, and decided this was the one to get. Here's a link to the hedgehog caught on camera the other night. The same camera position also caught a fox and rabbit in the same place. Excellent! I know there are hedgehogs about, but have yet to capture one on the wildlife camera. Perhaps the new one will do the job - I must download it soon. Good pictures. It is less obvious in gardens, but in the woods we get distinct paths that are used by certain animals, usually badgers. You can tell they are animal paths because they go under very low branches. From the sounds of it several different animals are using a similar path in your land. I have a number of distinct paths. This is partly because I am a bit lazy about mowing, though! 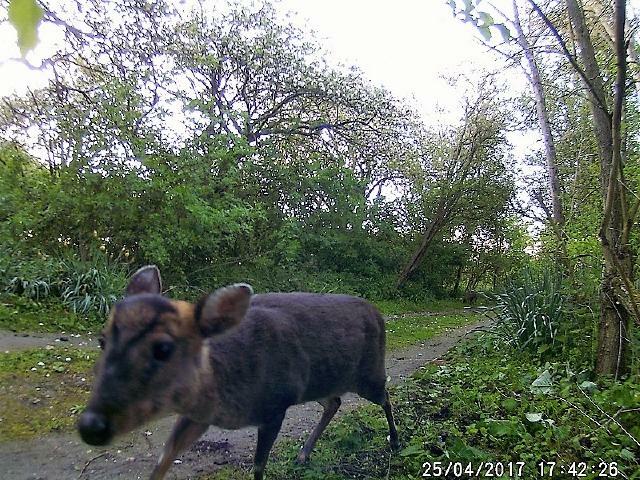 A female Muntjac (Muntiacus reevesi) getting a bit close to the camera . Other wildlife in the first three days have been a Grey Squirrel and a Wood Pigeon, Plus pictures of me going up and down the drive for the post and the milk. I'm quite pleased with the results so far - but if I get something new I will be extra pleased. Watch this space! From those pictures the muntjac look quite like wild boar. I haven't seen any, and we don't have any evidence of large numbers in the woods, although it is possible that the odd one has been spotted. Long may that last.